For light-as-a-feather doughnut holes, keep all the ingredients as cold as possible before frying them. If you decide to make doughnuts rather than just the holes, cook them for 5 to 7 minutes. This recipe will make about 3 dozen doughnuts. In a large bowl, sift the 3 1/2 cups flour. Then sift the flour again with the baking powder, baking soda, nutmeg, mace, cardamom and salt. Dust a marble pastry board or other work surface generously with flour. Scrape the dough onto the surface and dust the top with flour. Roll out the dough to about 1/3-inch thickness. Dip the center removable part of a doughnut cutter into a side dish of extra flour and cut out holes. Using an icing spatula, lift the holes onto an ungreased baking sheet. Cover with plastic wrap and refrigerate for at least 2 hours or for up to 1 day. To fry the doughnuts, in a deep-fat fryer or a deep saucepan, pour in oil to a depth of 3 inches and heat to 380°F on a deep-frying thermometer, or until a doughnut hole dropped into the oil turns golden within about 2 minutes. Working in small batches, slip the doughnut holes into the oil and fry until golden brown, about 2 minutes. Using a skimmer or slotted spoon, transfer to paper towels to drain. Sift 1 cup of the confectioners’ sugar into a paper bag. 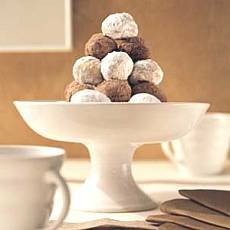 Sift together the remaining 1/2 cup confectioners’ sugar with the cocoa into another bag. Just before serving, shake half of the doughnut holes in the bag with the plain sugar and the other half with the cocoa-sugar mixture. Arrange on a platter and serve. Makes 9 dozen doughnut holes. Adapted from Williams-Sonoma Lifestyles Series,Brunch Entertaining,by Janeen Sarlin (Time-Life Books, 1999). It was the best donut I have EVER tasted !!!!! I had brunch with all my picky eating friends ... they ate every last bite and loved it soooo much!!! !